Do you believe in curses? Do you believe in karma? Do you believe everything happens for a reason and our lives are predestined no matter what we do? Or do you believe life is just on big "coincidence" after another? There are several compelling arguments on all aspect of life. Here are some of the more modern (and creepy) cases of what many believe to be proof curses exist. A curse (also called execration) is any expressed wish that some form of adversity or misfortune will befall or attach to some other entity—one or more persons, a place, or an object. In particular, "curse" may refer to a wish that harm or hurt will be inflicted by any supernatural powers, such as a spell, a prayer, an imprecation, an execration, magic, witchcraft, God, a natural force, or a spirit. In many belief systems, the curse itself (or accompanying ritual) is considered to have some causative force in the result. Robert Lincoin was the only child of President Abraham Lincoln to reach adulthood. Robert declined his parents’ invitation to Ford’s Theater the night his father was shot. His decision against going was something he regretted for the rest of his life. Later in life, President James Garfield offered him the position of Secretary of War and he accepted. He was to join the President at his college reunion. Running late, Robert arrived just in time to see Garfield get shot by Charles Guiteau. Having returned to private life again, Robert received another invitation in 1901, this time from President McKinley to attend the Pan-American Expo. Robert arrived to the Expo just in time to see Leon Czolgosz shoot the President. After the event Robert declined all invitations from Presidents, with the exception of the dedication of the Lincoln Memorial. The 27 Club, also called "Forever 27", was originally a term used to refer to popular musicians who have died at the age of 27, often as a result of drug and alcohol abuse, but now includes ALL celebrities who pass at this young age. This enigma is considered to be Hollywood's most profound curse. The Poltergeist Trilogy is probably one of the most famous Cursed Film stories and probably for good reason, the first film was made in 1982 and is based on The Freeling Family, but mainly their daughter, five year old Carol Anne Freeling, it tells the story of Poltergeists who invade the family home because it was built on a ancient Indian Burial ground, They seek out little Carol because she has Clairvoyant properties and they want her to guide them to the light because they are lost souls. 60-year-old Julian Beck (THE CREEPY OLD DUDE IN PART 2) died of stomach cancer on September 14, 1985 at Mount Sinai Hospital in New York. Beck died during the end of filming and the release. He had been battling the cancer for 18 months. 53-year-old Will Sampson (THE NATIVE AMERICAN SHAMAN) died on 3 June 1987 in a Houston hospital after receiving a heart-lung transplant 6 weeks earlier. The cause of his death was ascribed to severe pre-operative malnutrition and post-operative kidney failure and fungal infection. It has been said he knew his chances for survival were small due to his weakened condition prior to surgery. Samson was probably best known for his portrayal of the Indian in "One Flew Over the Cuckoo's Nest." Yes their stories are sad, as is the loss of anyone, but given their age and health history, their death came at no surprise Even though they were working on the same films and their deaths occurred relativity close, it could still be chalked up to a mere coincidence of bad luck. 22-year-old Dominique Dunne, Donna Freeling, (THE OLDEST DAUGHTER) died on November 04, 1982 at Cedars-Sinai Medical Center in Los Angeles. That was four days after her boyfriend choked her into a coma from which she never awoke. In 1982, after completing work on Poltergeist, Dunne met and later moved in with a Los Angeles man named John Thomas Sweeney (born and raised in Hazleton, PA), who was sous-chef at the restaurant Ma Maison. The relationship was abusive and, after a short while, Dunne ended it. A few weeks later, on October 30, he dropped by their former shared residence to plead with her to take him back. After she refused to reconcile with him, Sweeney and Dunne argued in the driveway, where she was rehearsing for the TV mini-series V with actor David Packer. The visit did not go as he had hoped, and with what he thought was going to be a quiet conversation, ended with him strangling her for what was later determined to be 4 to 6 minutes, then leaving her for dead in her driveway. Dunne was diagnosed as brain dead and after being in a deep coma for five days, she died on November 4 at Cedars-Sinai Medical Center in Los Angeles, California when her parents removed her from life support. Sweeney was convicted of voluntary manslaughter, sentenced in November, 1983, and released in 1986 after serving only 3 years, 8 months of a 6 and a half year sentence. His sentence is controversial to this day. Lou Perryman, who played Pugsley, (A SMALLER ROLE) was killed in his home in Austin, Texas on April 1, 2009 by a 26-year-old man named Seth Christopher Tatum. Tatum, who had recently been released from prison for aggravated robbery, had gone off his medications and had been drinking. He later confessed that he had killed Perryman with an axe. On June 26, 2009 Tatum was indicted on two counts of capital murder. Tatum pled guilty to murder and was convicted on February 1, 2011. He was sentenced to life in prison. The Death of 12 year old Heather O'Rourke, (WHO PLAYED THE STAR OF THE FILMS) Carol Anne Freeling. (Just four months before the release of Poltergeist III.) Heather had a bowel obstruction and was misdiagnosed with Chron's Disease. She was given medication that made her cheeks puff up and finally the misdiagnosis killed her. It was agreed by many doctors that her bowel obstruction should have been treated surgically not medically.O'Rourke became ill in early 1987 and was misdiagnosed by Kaiser Permanente Hospital as having Crohn's disease. She was prescribed medicine to treat the disease, which allegedly "puffed up her cheeks." On January 31, 1988, many months later, Heather suddenly became ill again, vomiting and unable to keep anything down. The next morning, while preparing to leave for the hospital, she collapsed, her stepfather panicked called paramedics instead. O'Rourke suffered cardiac arrest en route to the hospital, and after resuscitation she was airlifted by helicopter to Children's Hospital and Health Center in San Diego, where she died later that afternoon while undergoing emergency life saving surgery.Afterwards, while speaking to reporters, O'Rourke's manager, David Wardlow, initially announced that it was believed O'Rourke died of influenza. However, hospital spokesman, Vincent Bond, announced that O'Rourke died during surgery to repair an acute bowel obstruction (caused by congenital stenosis of the intestine) complicated by septic shock. This report was corroborated by the San Diego County coroner's office on February 3, two days after her death. Later reports changed the specific cause of death to cardiac arrest caused by septic shock brought on by the intestinal stenosis. JoBeth Williams (WHO PLAYED THE MOTHER) claimed she used to get home after filming and her pictures would all be askew on her wall, she said she would straighten them all but the next day the would go back again. The most Eerie thing about this curse story is that the film directors actually used real human remains as props in the poltergeist movie, so i am sure that really helped in angering the spirits. Rebel Without a Cause is a 1955 American film, it was directed by Nicholas Gray, and among the cast were James Dean, Natalie Wood and Sal Mineo, the film centres on a rebellious teenager who is played by James Dean, who comes to a town and meets a girl, played by Natalie Woods, rebels against his parents and takes on the local bullies, and becomes best friends with Sal Mineo's character. The main Star, 24 year old Heart Throb, James Dean, died in a car crash around a month before the film was to be released. On September 30, 1955, Dean and his mechanic/friend, Rolf Wütherich, were preparing Dean's new Porsche 550 Spyder for the weekend sports car race. Because the Porsche did not have enough "break-in" miles prior to the race, Wütherich recommended that Dean drive the Spyder to Salinas to get more "seat time" behind the wheel. At 3:30 p.m., Dean was stopped by a California Highway Patrolman and given a speeding ticket for going 65mph in 55mph zone. At 5:45pm, local 23 year old Donald Turnupseed was heading home from the opposite direction in his 1950 Ford Tudor. Donald chose to make a left turn that would put him in the history books. He didn't see Dean but Dean did see him and made an attempt to swerve out of the way, but the impact was unavoidable. The Ford broad-sided the Spyder. Dean's car landed near a telephone pole, 15 feet off the road. Rolf was thrown from the car but he lived. Turnupseed suffered minor injuries, and was able to walk away. Dean's body was raced to Paso Robles War Memorial Hospital, where he was pronounced dead on arrival. Co star Natalie Wood died by drowning while on a weekend trip to Santa Catalina Island, California, with her husband, Robert Wagner, actor Christopher Walken, and the boat's captain, Dennis Davern. Many facts surrounding her drowning are unknown, as no one admitted seeing how she entered the water. Wood's body was discovered by authorities at 8 am on November 29, 1981, one mile away from the boat, with a small inflatable boat found beached nearby. Wagner and Walken told officials they had an argument that evening but eventually calmed down. According to Wagner, when he went to bed, Wood was not there. The autopsy report revealed that Wood had bruises on her body and arms as well as a facial abrasion on her left cheek. The autopsy also found that Wood's blood alcohol level was .14, and there were traces of two types of medication in her bloodstream: a sea-sickness pill and a painkiller, which have increased the effect of alcohol. Los Angeles County coroner Thomas Noguchi ruled her death an accident by drowning and hypothermia following his investigation. According to the coroner, Natalie Wood had been drinking and may have slipped trying to board the dinghy. After a lengthy investigation, pizza deliveryman Lionel Ray Williams was arrested for the crime. In March 1979 he was convicted and sentenced to 57 years in prison for killing Mineo and for committing 10 robberies in the same area. Williams had claimed that he had no idea who Mineo was. Williams was paroled in the early 1990s, but he was imprisoned again soon for criminal activity. When the car was towed away from accident scene and taken to a garage, the engine slipped out and fell onto a mechanic, shattering both of his legs. Eventually the engine was bought by a doctor, who put it into his racing car and was killed shortly afterwards, during a race. 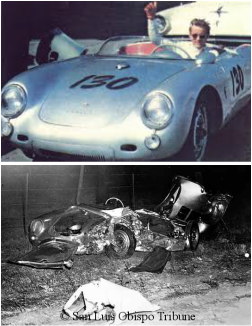 Another racing driver, in the same race, was killed in his car, which had James Dean's drive-shaft fitted to it. When James Dean's Porsche was later repaired, the garage it was in was destroyed by fire. Later the car was displayed in Sacramento, but it fell off it's mount and broke a teenager's hip. In Oregon, the trailer that the car was mounted on slipped from it's towbar and smashed through the front of a shop. Finally, in 1959, the car mysteriously broke into 11 pieces while it was sitting on steel supports. Now that's some CRAZINESS if I've ever heard of craziness! The story is based on the demonic possession of a young girl, Regan Macneil, (Linda Blair) and her Mother Chris Macneils (Ellen Burstyn) desperate attempts to free her daughter of this devil with the help of two priests. The film "The Exorcist" was adapted from the 1971 Novel, which was actually based on true events which took place in Maryland in 1949. In August 1972 while The Exorcist was being filmed many of the film workers felt a presence on the set, like something terrible was taking place, arguments were rife on the set because everyone was so tense and couldn't wait for it all to be over. In the September of 1972, Jason Miller, who played the priest in the movie, took his children to the beach for the day, but his Son Jordan was run down by a Motorbike, his legs were nearly crushed and he was rushed of to hospital in a critical condition, but after just ten days in hospital he made a miraculous recovery. At the same time strange and mysterious occurrences were going on on the set of The Exorcist. They started experiencing "electrical problems." In October 1972 the crew were all really spooked believing that the devil himself was trying to stop the film from going ahead, and so the film producers called in a real life priest who came and blessed the set and sprinkled holy water on the cast, the set and the crew. The following day they started filming the scene of Father Merrin's arrival, when Max Von Sydow, who played the part of Father Father Merrin, got a phone call to say his brother had died, so he had to fly home for the funeral. In January 1973 just after completing his scenes, Actor Jack MacGowran suddenly died of Influenza. Then a fire broke out on one of the sets destroying everything, the fire still remains a mystery. During the scene where Linda Blair is flipping around on the bed, she fractured her lower spine when the harness she was strapped to came undone, and the scenes of her screaming was real not acting, as the cruel directors wanted to keep filming her pain as they thought it would make the scene even better. Then the scene where the mother was slammed into the wall, she hit the wall so hard she to injured her back, and her screams were real as well. When the film had finished all the crew were relieved. The film got taken off for processing and the address was 666 5th Avenue. When The Exorcist was re released in 2000, Jason Miller who played Father Karass died suddenly of a heart attack. In July 2002 when a prequel to The Exorcist was being produced, the Director went for back surgery and suffered from a massive stroke and died. A new director took over and strange things started happening on set once again. The fax machine turned itself on and started throwing out loads of 666's line after line, which really freaked everyone out. Yet another Director, Renny Harlin, stepped in. After shooting a really bloody scene, Harlin went home to find his beloved Dog hemorrhaging, the blood was spraying everywhere and the dog was yelping in pain. His Dog was rushed to the Vets but the Vet could not find any reason for the Hemorrhaging. Later when Renny flew out to Rome to begin filming their, he was crossing the road and out of nowhere a car appeared and run him down. When Harlin was shown his X Ray he saw that their was thirteen screws in his leg. One of the film investors son died and he had to fly home, meaning the film lost out on a lot of money, but still filming continued. Also a night watchmen was killed while patrolling the set. Catholic Priest's believe the Devil did not want to be exposed, and these tragic turn of events were not coincidence but something more evil at work. The Omen was also a very controversial film with it's share of strange happening's on and off the set. Personally it was not as scary as some of the others, but it did have it's moments. The Omen was a thriller/horror film which was first made in 1976 and starred actors such as Gregory Peck, Lee Remick, and Harvey Stephens, A remake called The Omen 666, was released on the 6/6/2006 and that date was chosen as a reference to the number of the beast. The story is based on Robert Thorn and his wife Katherine who's baby died at birth. To save his wife from heartache, Robert substitutes the dead child for a orphan Damien, but when tragic events keep taking place as the boy gets older, Robert starts to suspect his adopted son is in fact the Antichrist. During Filming of The Omen, scriptwriter David Selter's plane was struck by lightening. Then one of the main star's, Gregory Peck, plane was also struck by lightening. The Movie's Executive Producer, Mace Neufields Plane was then also struck by lightening. Then a Hotel Mace Neufelds was staying at got bombed by the IRA. Then a Restaurant the Director and actors were eating at also got bombed by the IRA. An assistant to special effects consultant, John Richardson, on the other hand, wasn't quite as lucky. On Friday the 13th of August 1976, Richardson crashed his car in Holland. His assistant was sliced through by the car's front wheel. Scrambling out of the wreckage, Richardson looked up and saw a road sign: Omen, 66.6km. One of the film's tiger handler's died. Gregory Peck's son shot himself. A plane scheduled for use in the film, which was rescheduled and used for a commercial flight instead, crashed and killed everyone on board. Then a Stuntman on the Movie deliberately threw himself of a roof. MORAL-OF-THE STORY: If I were involved in the film's, I would FOREVER avoid airplanes and the IRA, I'm just sayin.